I'm a native of Salisbury, Connecticut. This week I finished a book about the circus fire. Tonight I spoke to my mom in Florida, who was a senior at Housatonic Valley Regional HS in Falls Village, Conn at the time of the fire. She informed me that the then Salisbury/Lakeville area veterinarian, Charlie Hines, lost a son in the fire, and my mom knew that the boy had been there with his maternal grandparents (this is verified on your list). Yours is the only victim list I have been able to find on the net. For completeness, if you wish, the hometown of victim Peter Hines, age 5, can be listed as Salisbury, Conn. Dr. Hines remained in Salisbury for many more years, but eventually moved to Florida where he took a professional veterinary position with the federal government. Thanks for your work and remembrance of the fire. May they all R.I.P. I still consider my Aunt Thelma my hero. My name was Janet Noren back then and I was almost 6 years old when I attended the fire with my Aunt Thelma Noren and two cousins. We were watching the high wire act and we saw a huge orange flash that we thought was part of the show. We were saying “Oooh.” Then people were yelling “Fire.” Fortunately, we were not seated very high and not far from an exit. My Aunt Thelma kept us calm, told us to hold hands, just walk-not run, and not to look back. We were able to walk out safely. People were screaming in the background. We did look back after we were safe and saw the billowing smoke and the tent collapsing. I live in Florida now and will never forget that terrible event. I still consider my Aunt Thelma my hero. If it weren’t for her calm care, we may not have survived. My father was in this fire and has recounted his story to me. Quite an ordeal. He was 11 years old at the time. His name is Richard Lambert. He lived at 41 Spring Street. It has taken this long for him to share his experience with me. All I can say is wow. I am grateful he survived but feel sorrow for those who did not. Thank you. My name is Stephanie Trombley. 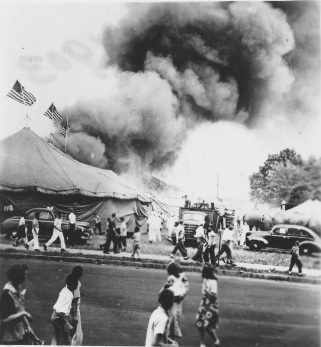 My Aunt, Sandra L. Logan, was killed in the 1944 Circus Fire. I don't know if you would want to include her information in the Victims List, but I thought I would submit what I know about her, and the incidents of that awful day. I'm very glad to see a website such as this devoted to this tragedy which has affected my family-and so many others. The fire and its victims should never be forgotten, and I, for one, will make sure my aunt is always remembered. Thank you for all the hard work and dedication. ...looking up to see the top of the tent on fire. I was at the Ringling Bros. circus in Hartford on July 6, 1944 when I was 4 years old. We lived on Elmer St at the time and my father, who worked the night shift at Pratt & Whitney Aircraft took me, while my mother staid home. We walked to the circus grounds since we lived less than a mile away. We never entered the tent to see the show, but I can still remember feeding the elephants and seeing a sword swallower, fire eater and fat lady in the side show. I remember hearing some yelling and looking up to see the top of the tent on fire. My father and I quickly left the grounds and went across Barber St to a house where my dad called my mother to let her know what was happening and that we were OK. On our way out of the grounds I remember seeing a little girl close to my age who was injured when her mom threw her from the bleachers in order to escape. I'm certain a photo on your website marked "Circus fire Picture #8" was taken from the front porch of the house where my dad made the call because I remember standing on that porch and seeing the same scene shown in the photo. I recently noticed something in that photo that knocked me for a loop. If you look in the picture you can see a man and a small child walking toward the camera with elephants behind them. I would not be surprised if that was my dad and I. I'm wondering if anyone has the original picture or negative that could be enlarged to tell for sure. My dad was moderately bald at the time of the fire and the man looks like he's also bald. The child holding the mans hand looks to be about my age at the time of the fire. I have never been able to put that day from my mind. Later, when I became aware of how many people died that day, I realized how close my dad and I came to that same fate. I also remember two people on the Survivors list on your web site. Mrs. John J. Czertak and her son Jackie was the the wife and son of John Czertak who later worked with my dad at Roger's Sash and Door in Hartford after the war. I think John senior was in the armed forces during the war. I remember my dad telling stories for many years of operations and treatment his friends wife and/or child had to have as a result of the burns they suffered on that day. Attended the circus with our aunt Ruth Morrell. We all got out safely through a slit in the tent side that someone made with his pocket knife. The tent bottom was secured to the ground. My aunt, Ruth Morrell purchased a brick for the Memorial. On the brick is me and my two brothers names Victor, Thomas and Patrick. Our last name is DeMichele and not on the brick. One of the stops on the 2008 Hartford Bike tour was the Hartford Circus Fire Memorial. I finally got to see the brick that my aunt purchased. I did not have my camera on this bike ride. She has never seen the brick. I plan on going to the memorial to take pictures of the memorial and brick for her to see. Hopefully I could find it by car. This is not my story. But it happened to a priest I lived with. Unfortunately, he has Alzheimer's and wouldn't be able to tell it himself. His name is Arthur Joseph Payne and he was at the circus with his younger brother. He just turned ten on 1 June, 1944. He said everybody ran when the fire caught the top canvas. Chairs were all over the place. He was trapped in the crush up against the stairs over the big cats runway. Then somebody, he doesn't know who, lifted him up over the stairs and the next thing he knew he was standing out in the field. He was separated from his brother, who also escaped. The family didn't find him until later that day. When the 50th Anniversary came, a book was published about the fire. Joe bought the book. He was telling me about it, when he admitted that he was there that day. He said he hadn't spoken about it ever, the memories were pretty well suppressed. The book brought a lot back. He showed the book to his brother. He asked him about what happened to him that day, and his brother wouldn't speak about it, even over the distance of 50 years. Art became a priest of the Dominican Order and was a very effective preacher. I know him by his religious name, Joseph. He is in infirmary care in Columbus, Ohio. His brother's name I can't recall. He married and has several children. He still lives in Hartford. That's pretty much it. I thought someone should tell the story. There were a lot of 10-year old and 7-year old kids traumatized that day. This is the story of 2 of them. I noticed that my brother was not with us. On July 6, 1944 my mother (Maxine Lerman) took my brother (Harvey Lerman) and me (Steven Lerman) to the circus for my 5th birthday celebration. My birthday was on July 3rd, so I am 70 year's old today. My brother will be 72 on September 7th. The best birthday present that I ever received occurred that day when the three of us survived the fire. My mother passed away in December 25, 2003 at the age of 87 and my brother and I are still around and kicking. My name is Steven Lerman and I was born on July 3, 1939 in New York City. My parents were Irving and Maxine Lerman and my older brother, Harvey, was born on September 7, 1937, also in New York. My father worked for his father, who was one of the largest monument dealers in New York City, having a large factory on Long Island and a retail store in the city. My father was anxious to be on his own, so he bought (with his father’s help) a monument business in Hartford, Connecticut in 1941 (or 1942). He named the business “Artcraft Memorials” and it was located at 1450 Main Street just across the tracks from Firestone. The rest of our family was left in New York until my father got his business started and acquired a residence for us. My mother told me that prospective landlords were reluctant to rent to a family with two toddlers running around. Consequently my father purchased a triple-decker house at 51 Norfolk Street in Hartford. Norfolk Street is off Blue Hills Avenue not far from Albany Avenue. The family moved in during the summer of 1942. We lived in the apartment on the second floor and the first and third floor apartments were rented out. For my fifth birthday on July 3, 1944, my mother wanted to take my brother and me to see the circus which was coming to Hartford. My father urged my mother to take us to the evening performance so he could come with us, but my mother was concerned that it would be too late for her young boys. So my mother, brother and I went to the matinee performance on July 6, 1944. The three of us were sitting in the bleachers and when someone yelled “fire”. My mother quickly told us to drop down between the seats to the ground. Someone slit the tent and we went through the opening. I remember running through a field and then we entered some woods. We were all afraid that the woods would catch fire, so we ran as quickly so we could to get out of the woods. When we finally stopped out of the woods, I noticed that my brother was not with us. My mother told me many years later that she knew that my brother didn’t jump to the ground with us, but she had to go with the rush of the crowd as she was afraid of being trampled. She saw my brother start to go down the seats toward the main entrance of the tent. We then went toward the circus entrance area looking for my brother. Luckily we found him standing on the curb watching the firefighters. He said that he just went out of the tent the same way that he went in. We were very fortunate that this way was not blocked by the animal entrance cages. My mother then looked for a phone to call my father. She knew that my father was in his shop on Main Street, would have heard all of the fire engines and would have found out about the circus fire. Unfortunately there were long lines for every telephone in the area. Therefore we started to walk to the bus stop to take the bus to my father’s shop. At that time I noticed a twig, may two inches long, sticking out of my mother’s leg just below her knee. She hadn’t felt a thing with all the commotion going on. She removed the twig and stopped the bleeding before getting to the bus to my father’s shop. When we arrived at the shop, no one was there. My mother had a key and we went inside where my mother tried to call her parents in New York, but the long distance telephone lines were busy. My mother then called a local friend of hers, who knew that we were going to the circus, to inform her that we were all fine and then we waited for my father to return. My father had heard the fire engines and was told about the circus fire. He then closed his store and went to the circus to try to find us. When he arrived at the circus, he saw the inferno and started to look for us and even looked at the dead bodies. After a while, he managed to get to a phone and called my mother’s friend, who told him that we were all fine and waiting for him at his shop. He then went back to his store to find us. We took my mother to the hospital to look at her leg wound and she received some stitches. It wasn’t until the next day, that my mother was able to call her parents to tell them that we weren’t hurt. They where very concerned, but they couldn’t get through to us either. The next day my father got very sick as the events of the previous day finally got to him. My mother sent my brother and me to New York to be with my grandparents, while she tended to my father. He fully recovered. To this day when anyone asks me what was my best birthday present, I respond by saying that my best birthday present occurred when my mother took my brother and me to the circus and we all survived when the circus burnt down with over 160 people dying. No one has ever beaten that. ...looking back and seeing huge clouds of black smoke. My name is Michael "Mickey" Bailardo. My father was a fireman and eventually made Deputy Chief of the Hartford Fire Department. He helped to fight the fire that day. 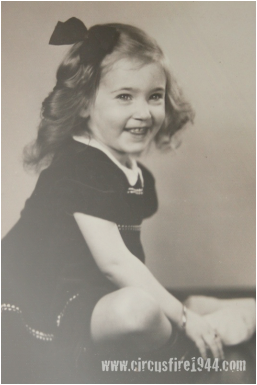 I was 6 1/2 years old on July 6, 1944. A good friend of my mother's teen age daughter, Isabel Montana was going to attend the circus that day with another teenage friend of hers. I don't recall her name. My mother's friend asked my mother if I would like to go along. She said OK after a little pestering from me. So, off I went with the two teenage girls. I know we took a bus from the corner of Preston Street (I lived at 166 Preston Street in those days) and Franklin Avenue. My memory is a little fuzzy on some of the details. I do know we were seated in bleachers. Not at the top, but, probably 10 to 12 rows up and on the far right of the row. There was a rather large entrance that I believe the acts were using adjacent to us and then more bleachers. I don't recall seeing the fire until we were outside. I do remember hearing several people yell fire. Isabel and her friend grabbed my hands and we all jumped to the ground and ran from the tent through that large entry way. I remember looking back and seeing huge clouds of black smoke. More smoke than flame. I also remember someone walking elephants out and hundreds of other people running. I'm now 71 and the details are fuzzy. But, somehow got on a bus and headed home. When we stepped off the bus at Franklin and Preston we saw my mother running down Preston Street. (We didn't own a car.) She was going to head out to the circus grounds to try and find us. Timing is everything in life. My mother wasn't aware of the fire until her sister called her on the phone. Her sister (who lived in Wethersfield) had heard about it on the radio and called my mother to tell her. After I got home, I remember hearing pleas on the radio for all available doctors and emergency equipment. The next day, I remember my mother telling me that some of the Berman family had perished in the fire. They owned a clothing and appliance store on Franklin Avenue called Bermen's. I didn't know the Bermen family. But, I do know we used to shop at their store on occasion. It no longer exists. I'm afraid that's the extent of what I can recall. I believe I have newspaper clipping from the Hartford Times (long ago defunct) tucked away somewhere. I believe the clipping have accompanied me over the years. But, it will take some rummaging through drawers and boxes to find them. ...identify my sister by the red Wizard of Oz shoes she was wearing. My sister Carolyn Derby was killed in the fire. My mother Ethel Derby was burned as well as my brother William F Derby Jr. They lived at 19 Boswell Road West Hartford, CT. My father always said they went with some people down the street (Loretta Dillus) and her mother Maby. I was only one year old and was with my grandmother that day. My mother was in the hospital one of the longest. I think she got hepatitis from blood transfusions. She died of liver cancer years later. My father went to the fire. He was able to identify my sister by the red Dorothy of Wizard of Oz shoes she was wearing. We still have them.